Aren't these photos of the heavenly, white Montblanc House almost unreal? The home, completed by Studio Velocity in 2009, is so airy and ethereal that it's hard to believe it sits on a rather nondescript block in the suburbs of Japan. As you can see, the residents enjoy the generous cutouts in the roof which create flexible indoor/outdoor rooms and allow daylight to drench the interiors. Click through our gallery to see more photos of the delightful spaces in the home, like a gorgeous enclosed garden and a patio space accessed by climbing up a ladder! The Montblanc House, which is also known as “Shiroi Yama no You no Ie” in Japanese or “House That Resembles a White Mountain,” is a three story home that we think was named quite aptly. 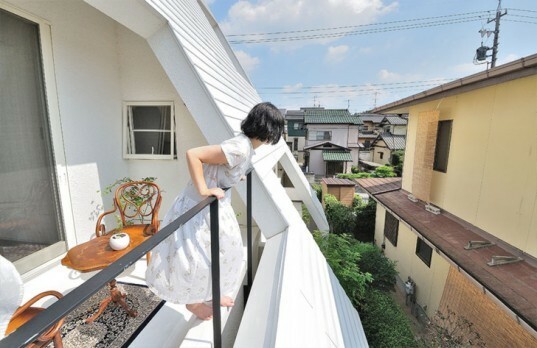 Designed by Okazaki-based Studio Velocity, the home resides in a quiet residential area of Japan. Although the area isn’t as cluttered as the big city, the home is enclosed by neighbouring buildings on three sides, so the architects were aiming to create more of an airy feeling without detracting from privacy. By envisioning the entire volume in one color, white, Studio Velocity was able to make it seem lighter, brighter and more spacious than it actually is. They also cut away large portions of the roof, but instead of adding glass, they chose to keep the spaces open, letting in air and light. In addition to this open design, the whole home is filled with greenery. There is a small garden on the first level and several patio spaces for the homeowners to enjoy as well as a modest yard in the back. 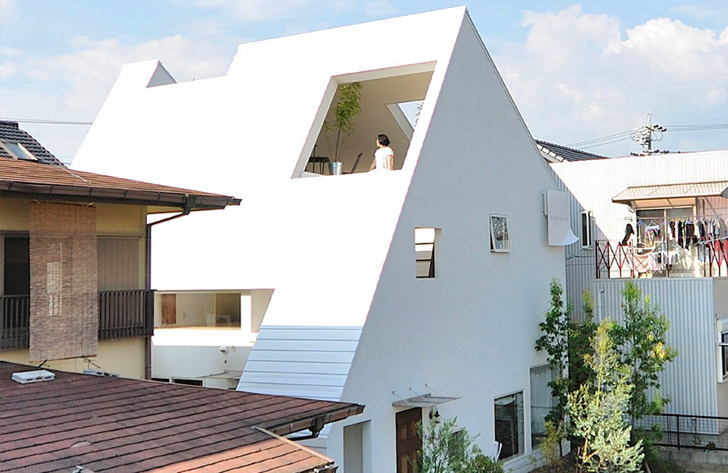 The Montblanc House, which is also known as "Shiroi Yama no You no Ie" in Japanese or "House That Resembles a White Mountain," is a three story home that we think was named quite aptly. Designed by Okazaki-based Studio Velocity, the home resides in a quiet residential area of Japan. Although the area isn't as cluttered as the big city, the home is enclosed by neighbouring buildings on three sides, so the architects were aiming to create more of an airy feeling without detracting from privacy. By envisioning the entire volume in one color, white, Studio Velocity was able to make it seem lighter, brighter and more spacious than it actually is. They also cut away large portions of the roof, but instead of adding glass, they chose to keep the spaces open, letting in air and light. A giant cutout that's perfect for seeing the fireworks in this neighborhood during the summer celebrations! In addition to this open design, the whole home is filled with greenery. There is a small garden on the first level and several patio spaces for the homeowners to enjoy as well as a modest yard in the back. A peaceful precipice that can be accessed via a lone ladder. The kitchen is filled with light and even has a small eating nook beside it.